Professor Dr. Md. 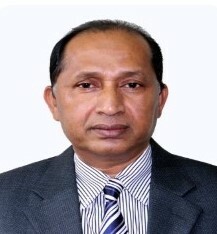 Giashuddin Miah, born in 1960, joined as Vice-Chancellor of the Bangabandhu Seikh Mujibur Rahman Agricultural University (BSMRAU) on June 11, 2017; is a Professor of Agroforestry and Environmental Science in the faculty of Agriculture; served as Treasurer since 2009 to 2013; Served as Dean the Faculty of Graduate Studies in 2012 t0 2014; maintained an excellent academic career in all public examinations; obtained First Class in B. Sc. Ag. (Hons) and M. Sc. Ag in Agronomy from the Bangladesh Agricultural University (BAU), Mymensingh in 1982 and 1984 respectively, and Ph. D. in Crop Science 1993; Specialization on Agroforestry and Environment; Grade-Excellent; Central Luzon State University and IRRI (Research Scholar), Philippines and doing Post-Doctoral (i) Kyushu University, Japan, 1995-96; (ii) National Institute of Agro-Environmental Sciences, Japan, 2000; (iii) University of Laval, Canada, 2009; (iv) University of Nottingham, UK, 2013; started scientific career at the Bangladesh Tea Research Institute (BTRI) in 1984 as Scientific Officer and became Senior Scientific Officer at the Bangladesh Agricultural Research Institute (BARI) in 1985 there in 1993; switched over to academic profession as Assistant Professor in Agroforestry & Environment at the then Institute of Postgraduate Studies in Agriculture (IPSA) in 1996; played a vital role in transforming IPSA into the Bangabandhu Sheikh Mujibur Rahman Agricultural University (BSMRAU) in 1998; became Professor of Agroforestry & Environmental Science in 2000; served 12 Consecutive years as Head of the Department of Agroforestry & Environment for the second time now; served Co-chairman, Steering Committee Member, Scientific Planning Group (SPG) Member and Capacity Development Committee Member of the Asia-Pacific Network for Global Change Research (APN); Chairman, South Asia Sub-regional Committee of APN; Country Representative (Honorary) of World Agroforestry Center/ICRAF since 2000, Principal Investigators of several international joint projects with (i) Sri Lanka, Bangladesh and India (homestead diversity project), 2010-2012; (ii) Nepal, Bangladesh, Thailand and Vietnam (Climate change and forest community), 2010-2012; (iii) Australia, Indonesia, Philippines and Bangladesh (Weather forecasting project), 2011-2013; (iv) India, Bangladesh, China and Sri Lanka (Ecosystem services project), 2014-2016; (v) China, Bangladesh and Japan (Land use policy), 2016 to on-going; so far supervised 12 PhDs and 103 MSs and published Published 2 books, 3 book chapters, 108 scientific papers; participated 69 International programs at abroad seminars, workshops and forums; and serving in a number of important national committees.